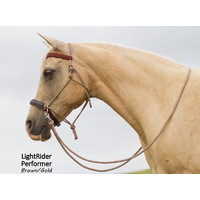 Ideal for western breeds, reining, cutting, shows, pleasure and trail. 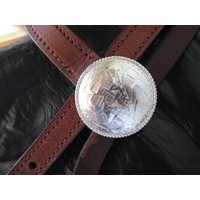 Made in top quality Drum Dyed Leather in black or tan with silver conchos, scalloped browband and cheeks, or in black or dark brown Deluxe Beta Biothane with plaited horsehair browband (by custom order). Stainless steel hardware for strength and longevity. 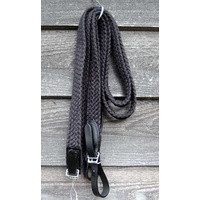 Padded noseband offers more comfort. 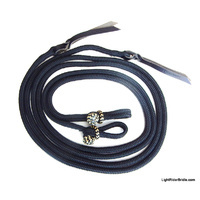 Made in top quality Drum Dyed Leather in black or tan. 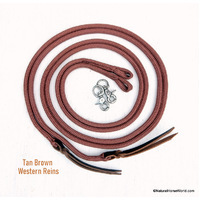 Also available in black or dark brown Deluxe Beta Biothane with plaited horsehair browband (by custom order - email us). I think your bridles are fantastic. My horses go really kindly in them. 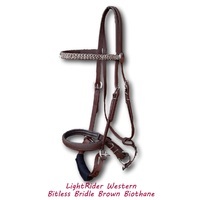 I'm very happy with the new western bitless bridle. 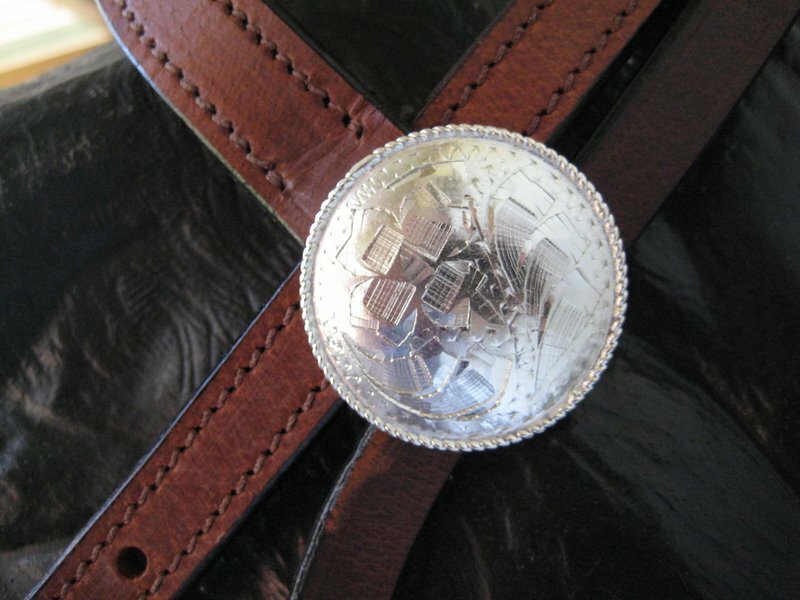 It fits comfortably on my horse, is easy to slip on and looks good. 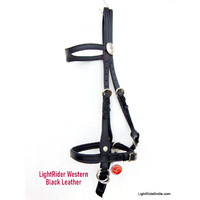 I find all the Lightrider bitless bridles kind and effective on my horses. 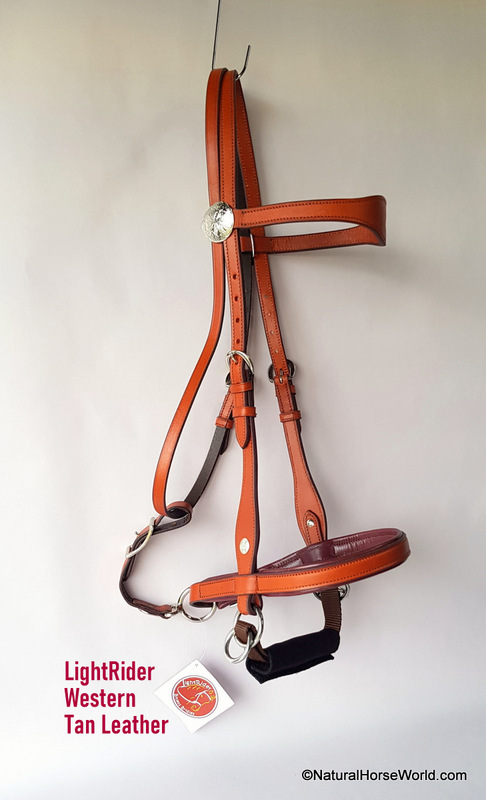 I am very pleased with this Bridle. My horse is very responsive in it and it looks great! Great quality. 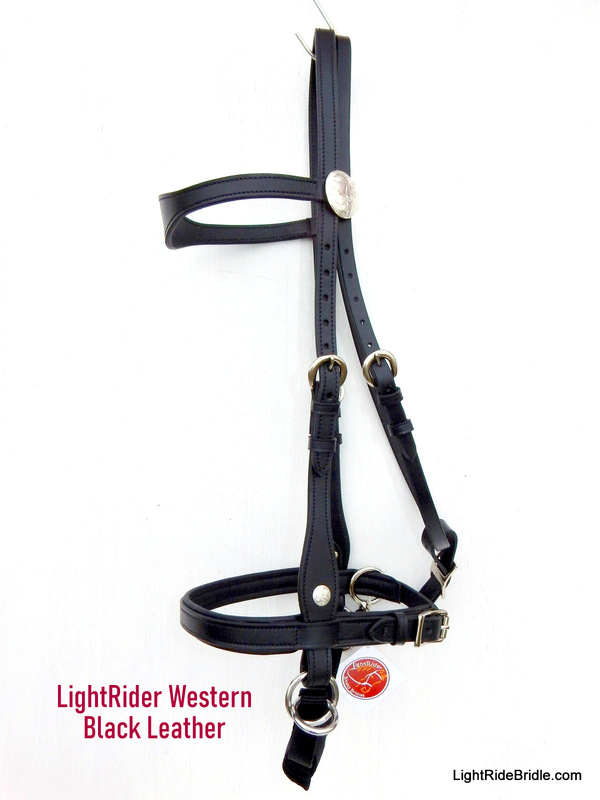 I just love my Lightrider Western bridle and so does my horse. 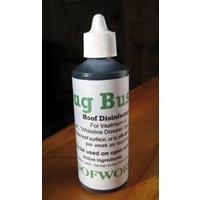 The quality and fit are outstanding, and are exactly what I have come to expect from your products. 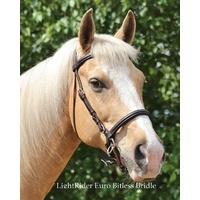 I am very impressed with the quality of this bitless bridle. 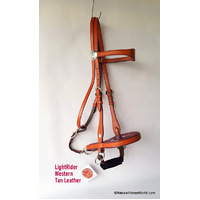 I used it for the first time this morning and my mare behaved much the same as she does using a bit. She has never liked accepting a bit so it was very easy bridling her with this product. Even though it was something new to her, I felt she was accepting it rather well. I love my new light rider reins. 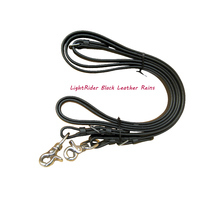 I also have Dr. cook reins and like the light rider reins a lot more. 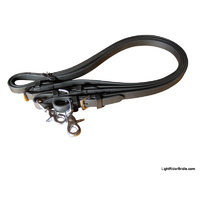 better respond in my horse with the light rider reins. 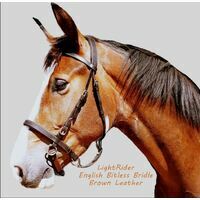 I recently purchased an english leather bridle from Cynthia for my QH gelding(prior to that, I rode him in the rope lightrider). 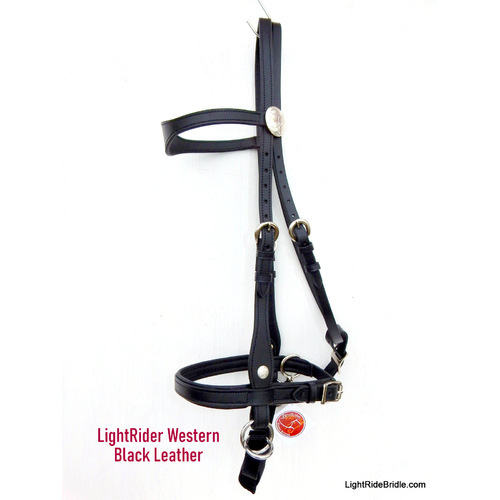 Leo is higly responsive in this bridle and has now mastered the ROLLBACK! I love seeing the look on the bitted horses riders when I show them up in the "camp" all without a bit!!! LOVE it! Very adjustable! Fits quite good. I received my bridle a couple of days ago. 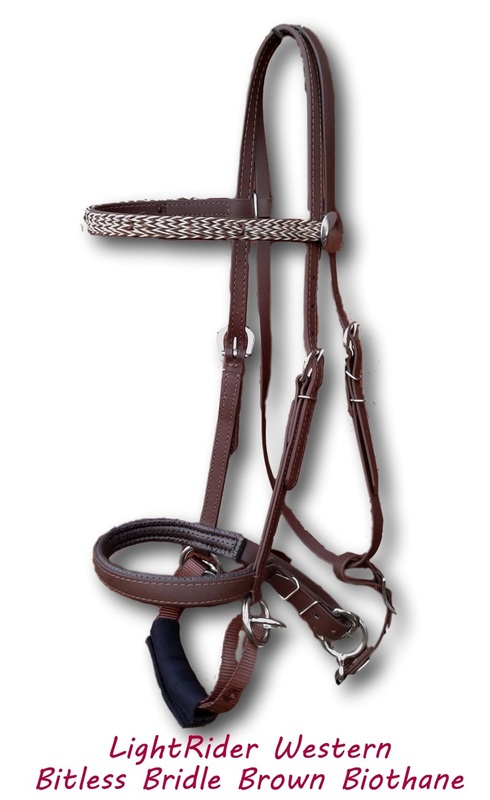 Let me say before I go any further that I am extremely impressed with the quality of this bridle! Very well made. Substantial and it is very attractive. I got the western style. I got my first chance to try it this morning. 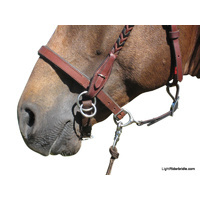 I had a couple problems with my TWH using the crossunder bitless bridle. First Feather, would get very bracy at times would just kind of get a bit catatonic for a few moments. He would go fine at times and be very responsive but, when he decided he didn't want to do something he would just brace through it all. I have been trying to get a nice light neck rein on him for quite awhile. So I have been looking for a different alternative. I came across your bridle and thought maybe this was just the answer for Feather, and I. It works on a totally different concept. Well it is just what we have needed!! We went for a short ride this morning and Feather never braced with me. He just neck reined beautifully. Never pulled on me or tried to push through the pressure, I guess actually because his head wasn't wrapped in pressure! He also had a very nice whoa. We want to thank you for designing this great product! I was never going to ride in a bit again period so am very happy to find this alternative. 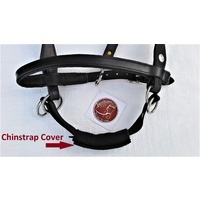 Let me add a note about the crossunder bridle. I had two other big powerful horses that I put in that bridle and they did great. So maybe it just isn't made for every horse. 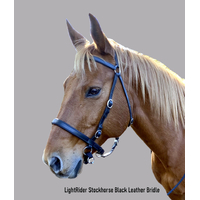 I'd like to think how they might have done in your bridle........... We dearly love this bridle. 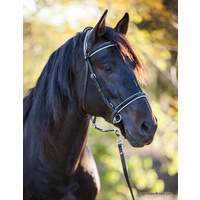 Thanks again for creating this wonderful bridle for all of us.